* Ceramic Coating Finish New 2011-13 Mustang GT Direct fit Shorty Headers & Street Legal After Cat X Pipe From BBK are Now Available Take a first look at the all new 11-14 Ford Mustang GT & Boss 302 5.0 BBK 1-3/4 direct fit tuned length headers and replacement High Flow Street leagl after cat 2-3/4 X pipe. 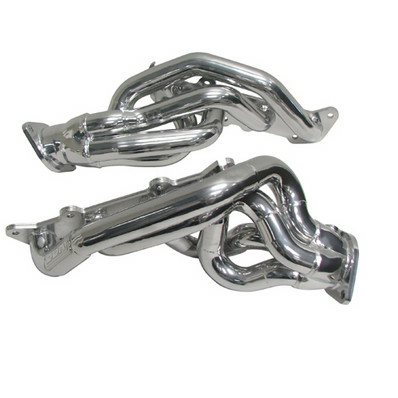 (available separately) BBK R&D department developed these headers with one thing in mind  Getting even more horsepower and torque out of the all new 2011-13 5.0 liter Mustang that is already putting out nearly twice the horsepower of its 5.0 predecessor! This all new rugged BBK header design is constructed with 1-3/4 CNC Mandrel-Bent tubing and solid 3/8 laser cut exhaust flanges. Initial testing is showing gains of around 14 horsepower with the high flow after cat X pipe  and BBK will have an off road cat eliminator system out shortly for even more horsepower gains All exhaust header kits include new gaskets and hardware. No one else can Stack up to the bold clean styling of our aftermarket Billet / Stainless Steel Dress Ups, Street / Strip / Racing Suspension and Performance Parts for your American Muscle Car! Fits these Vehicles: 2011 2012 2013 2014 V8 GT 5.0L Coyote 4V Boss 302 Mustang Steeda Roush & Saleen Vehicles. Made in the USA!